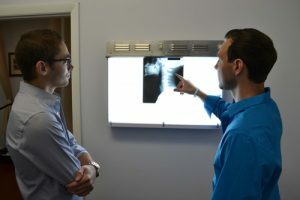 Your first Phoenix Chiropractor visit will include a consultation, examination and precise Blair x-rays of the neck. The x-rays allow the Blair doctor to analyze how your C1 or C2 vertebra has misaligned and develop a precise upper cervical correction customized to your neck. The goal of your Blair doctor is for your neck correction to hold as long as possible as that will allow you to see results quickly and heal as fast as possible. On subsequent visits you may or may not need an upper cervical correction (adjustment). Your doctor is able to determine when a correction is needed by performing leg checks, range of motion and a neck scan with a heat reading instrument. Precise x-rays are the hallmark of the Blair Upper Cervical Technique. The Blair head clamp allows the doctor to take precision x-rays down joint angles unique to each person to ascertain the direction your atlas has misaligned, thereby allowing the doctor to make a precise neck correction with holding value. All Blair upper cervical offices use heat reading instruments. This heat scan of the neck area is one of the objective tests that are utilized by an Upper Cervical Blair doctor to determine whether you need an adjustment or not. These are objective tests that help the doctor determine two things. If you need an adjustment or not and at what vertebral level the adjustment needs to be made. The leg checks are used in conjunction with the heat scan, allowing the doctor to know when a Blair Upper Cervical Upper Cervical Adjustment is needed. All Blair Upper Cervical Adjustments are made on a side posture table (named because the patient lies on their side). This table is low to the ground and allows the doctor to have a biomechanical advantage in making these precise corrections. The adjustment is quick and gentle. The neck is never twisted or manipulated. Chiropractic adjustment is a procedure in which trained specialists (chiropractors) use their hands or a small instrument to apply realignment of the spinal joints. The goal of chiropractic adjustment, also known as spinal manipulation, is to correct structural alignment and improve your body’s physical function. After a specific Blair Upper Cervical correction the patient rests in a quiet room for 10-20 minutes. The rest allows the body to re-gain control of the position of the corrected vertebra. This is essential to help maintain the upper cervical correction. The Blair Upper Cervical Technique is an objective upper cervical technique focusing primarily on misalignments in the first bone of the spine (Atlas) as it comes into contact with the head (Occiput). Special attention is given to the first two cervical vertebrae, the atlas and axis. The intention of a chiropractic adjustment is to affect or correct the alignment, motion and or function of a vertebral joint. Specifically, they are intended to correct “vertebral subluxations”, the term given to the signs and symptoms of abnormal alignment of vertebrae.